Shell the broad beans and put into a saucepan with a small amount of boiling water. Cover the pan and boil rapidly for 5 to 10 minutes until the beans are tender. Drain. Peel and chop the onion. Cut the chill pepper in half and remove the seeds and chop finely. Blanch and peal the tomatoes and cut into halves and remove the seeds. Fry two slices of bacon in a saucepan until crisp. Remove from the pan with a slotted spoon. Add the chopped onion and pepper to the pan and fry, stirring frequently, for 5 minutes or until tender but not brown. Add the tomatoes, cover the pan and cook, stirring occasionally, for 15 minutes. Add the beans and season to taste with salt and pepper and cook for 3 minutes more. Transfer to a serving dish. Crumble the bacon over the top and serve hot. 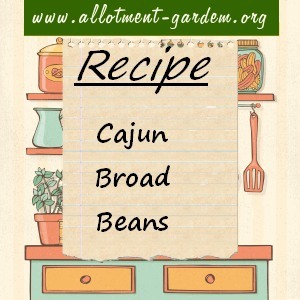 This Cajun Broad Beans Recipe serves 4. A taste of French Louisiana!